A big welcome to Diane and Mark Smith from Australia. 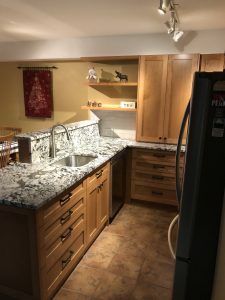 Over the past few months we have been communicating via phone and email, on their condo kitchen renovation. New cabinets and Granite countertops complete with undermount sink. Diane and Mark had specific ideas in mind to generate more efficient storage. What a stylish kitchen it turned out to be for the Home way from home.